I hope you've been enjoying this new little series on preschool crafting and learning! I am really finding a lot of joy in planning these activities for Nolan, and he is eating up the one-on-one time with me! This week, we had a lesson based on a Halloween favorite: CANDY CORN! I printed a couple of blank candy corn templates (found here) and cut them out. 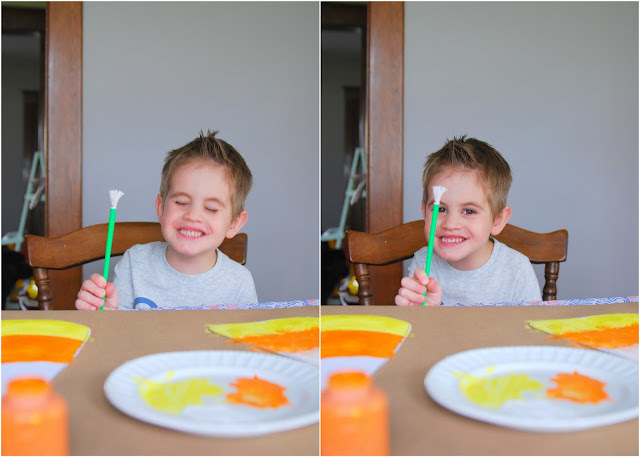 Nolan and I each painted one with yellow, orange, and white tempera paint. He did really well at keeping his colors separate! Then, we worked on a Candy Corn Activity Book (printed free from My Sister's Suitcase). It's geared for grades K-2, but Nolan was able to keep up with most of it. It has activities for addition, measurement, counting, and patterns. We worked on some simple addition problems using the candy corn as visuals. The last page was on measurement--but we didn't get there before Ephraim woke up from his nap and started demanding candy. If you blog, remember we're sharing outfits that transition from day to date tomorrow for the Every Girl Link-Up! See you then! We are building geometric figures with candy corn tomorrow in my math class!